Preheat oven to 325º F/ 160ª C.
Make a broth while preparing the chicken. Save 1½ c for couscous and let cool. Lightly grease a cookie sheet. Place the breadcrumbs on it. Spread them out into a thin layer and heat until there is no more moisture. If making breadcrumbs from bread this will take about 15 minutes. If using store bought breadcrumbs, it will take less time. Remove from the oven and rake the breadcrumbs until all the moisture has evaporated. 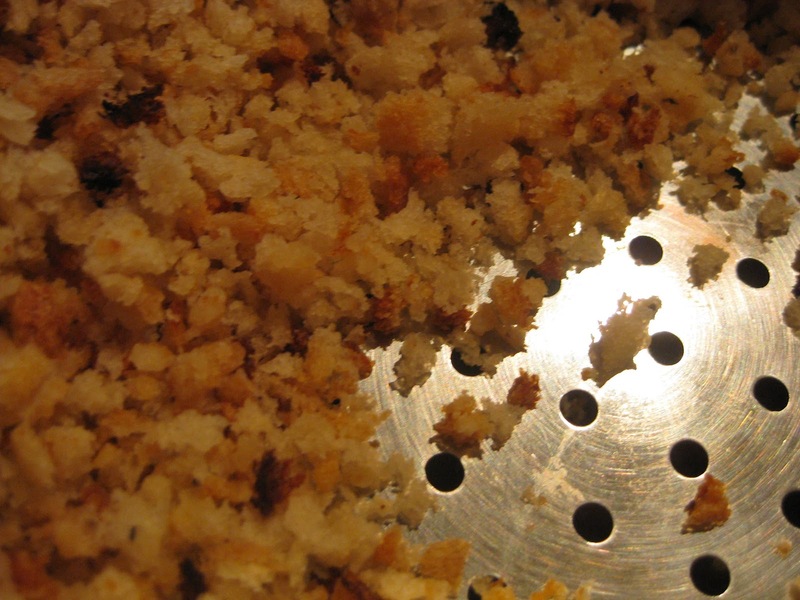 Spread half the breadcrumbs on a large round plate. Sprinkle a few tablespoons of the broth over the crumbs and, at the same time rotate in a circular motion using the palm and fingers, of one hand, always moving in the same direction, to create tiny spheres. After two or three rotations, begin to sprinkle the crumbs with the other half of the crumbs and about ¼ cup broth alternately on the spheres while continuing to rotate the crumbs. As the spheres absorb the breadcrumbs and water, they will turn into tiny couscous "beads" more or less the same size. Another 1 to 2 tablespoons water may be needed at the end of this step and other steps but care must be taken not to add too much water as this can turn the couscous into a mushy porridge. Fill the bottom of a couscoussier or vegetable streamer with water. Bring it to a boil. Shake or press the couscous "beads" by making a fist and rotate it around for the “beads” to fall through the strainer into a pot. Place the couscous into the lightly oiled perforated try of the couscoussier or streamer. Partially cover and steam 15 minutes. 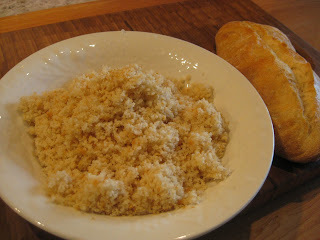 Put the couscous on a plate and break up lumps with a fork or whisk. Sprinkle with ¼ c broth and rake the grains to keep them separate. Mix in 1 tbsp olive oil. Gradually add another ¼ c of broth while raking the couscous. When the couscous has absorbed all the water steam again for 15 minutes. Prepare the chicken or goose and cook it separately or with the couscous as desired. Put couscous on the plate. Gradually work in ¼ cup cold water, and rake the grains to keep them separate. Allow to rest, covered with a damp towel for 15 minutes. Fluff up the couscous and loosely cover with the damp towel until ½ hour before needed. Wash turnips, cut stems off and slice them. Put them in boiling water and let boil for about 15 minutes. Remove from the pot rinse them with water. Remove the pits from the prunes, slice them in half or quarters and soak them in 2 c broth. Bring water back to a boil. Return the couscous to the perforated part of the couscoussier or streamer with the turnips, prunes and possibly the chicken cut into pieces and steam, uncovered, an additional 10 to 15 minutes. 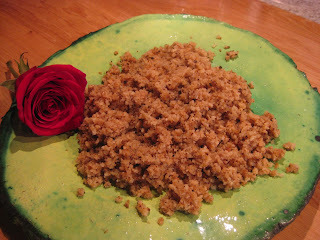 Couscous lightens in color when fully cooked. Turn the couscous out onto a wide shallow serving dish and toss with oil or butter and moisten with ¼ cup broth. Let stand, covered, for 10 to 15 minutes. Gently fluff the couscous, pile in a mound, and decorate with meat and vegetables. CAN WITH A SPANISH DOG!